One last look at the target. 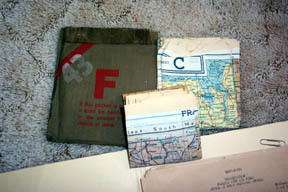 Each crew member carried a set of maps to have in the event that they went down. These maps belong to Jack Hayden. The regular bombardier was sick the morning of May 29th. Jack Hayden was on standby and became their "pick up" bombardier. Jack only had one more mission to go and he wanted to get home. So he would be part of the crew that day. This was his first time flying with the Forsyth crew. Forsyth later said of Jack, "He was a nice guy and a good bombardier." According to Jack, the pilot he normally flew with got the idea he wanted to be a big shot somewhere around their 15th mission. "He wanted to be a pilot who would get 'em," said Jack. Jack later saw that pilot in Miami. The crew woke up at 3:00 AM and were on the flight line at 3:30. 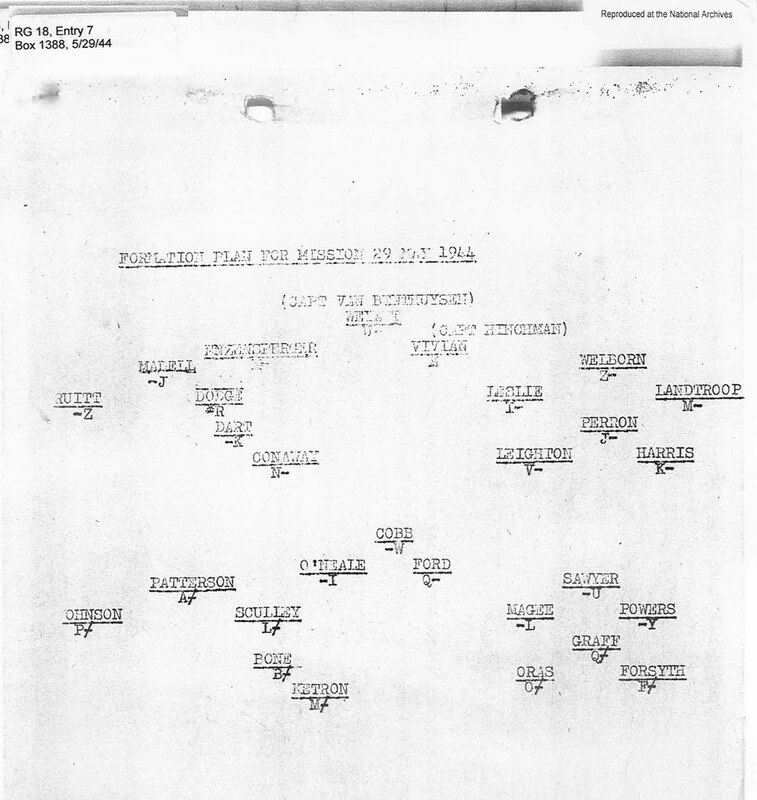 At that time they were assigned to 42-94973. The plane did not have a name at that time but went by the letters on the tail, RR. As soon as dawn broke, somewhere around 5:00 AM, they took off for Politz, Germany to bomb the shipping harbor. 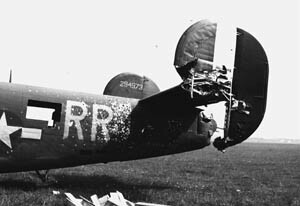 According to John Forsyth, "It flew good. We didn't have any problems with it". This was my Dad's 29th mission. Click picture to see where they were on this day. Little did they realize that this was going to be their last mission together. They took their "usual" 52 degrees 30 minutes N, a route which they referred to as the Lincoln Hwy. over the Zuider Zee, Doomer Lake south of Hannover, south of Berlin, turned north and were bombing the port of Stettin on the Baltic seaport just north of Berlin. There was heavy ground fire and flak took out the supercharger on the number 2 engine enroute to the target. It wasn't far to the target so they feathered the engine and continued on. They reached their target and were able to drop their bombs. 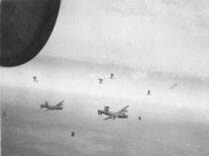 After dropping their bombs they turned back over the Baltic Sea for Hethel, Norfolk. 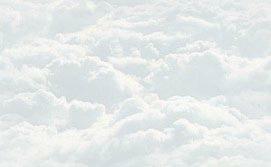 Because of the loss of the one engine, they were trailing the other planes in their flight. 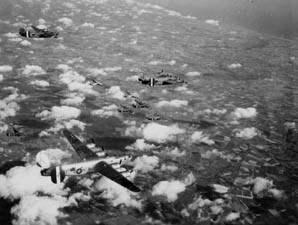 They had no sooner made their turn for home when they were surrounded by 18 Me210's German fighters. Every gunner was in position and firing their machine guns. 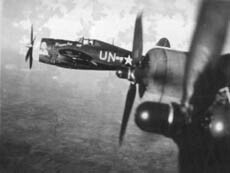 The tail gunner reported that at least 3 of the Me210's were shot down before they were hit themselves. Jack Hayden said he had seen 5 go down. Three of them right away and two that were smoking but turned back to Germany. He didn't see how they could have made it. 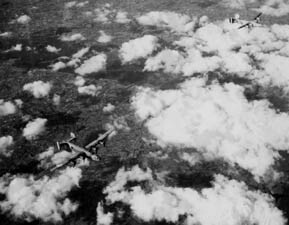 The remaining fighters continued their pursuit of the larger group of bombers. According to Hayden, Mulqueeny, the tail gunner, saved them. The No. 3 engine was hit and caught on fire but they were able to get it extinguished. The prop on that engine was also feathered. The left stabilizer was almost totally demolished and a wheel was shot. The hydraulic system was shot out so the flaps and landing gear all came down. The rest of the plane was full of holes. They were hit by 20 mm shells and a couple of rockets. S/Sgt. 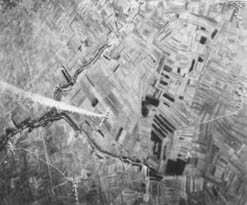 Richard Sawyer, the left waist gunner, was wounded quite badly in the right arm by a 20 mm shell. When Sawyer was hit it blew him onto Kellis knocking them both down. While Kellis was trying to get Sawyer off of him he was hit in the back and some metal hit him in the right eye so he could not see very well. Jack Hayden made his way out of his position to go administering first aid to Sawyer. It was about that time that the top gun turret was hit. T/Sgt. Harold N. Rhodes, the engineer and top gunner, was hit in the neck knocking him out of the turret. He fell to the floor of the plane landing on the bomb bay doors, which just minutes before had closed. About that time 4 or 5 more bullets went right on through between Hayden and Rhodes. According to Hayden, Rhodes had a close call. Although Rhodes was "bleeding like a stuck pig" it was soon determined that he was going to be all right. He was quickly given some morphine for the pain. Forsyth had little control of the plane so Rhodes crawled to the back of the badly shot up tail section and found the cables for the vertical and horizontal stabilizers shot in two. He tried to repair them using his belt but was unsuccessful. The left router was pretty well shot off. Forsyth does not know how he was able to get enough control to keep it in the air. They were loosing altitude and fuel fast. Forsyth asked 2/Lt. Francis Giardiello if they would be able to make it back to England. He said there was no way. Forsyth asked him for a route to Sweden but Giardiello did not have the sectional maps for that area. At this time Forsyth was wishing he had taken Prueher after all. This was Giardiello's first mission. Forsyth made a turn and "guessed". Giardiello later gave Forsyth a heading that would have taken them to occupied Denmark! Forsyth told him, "If and when we get on the ground, stay out of my way!" He did. The crew knew they were going down too fast to make it to England. They also knew that landing in the Baltic Sea would be disaster and landing in Germany would mean being prisoners of war. 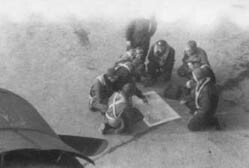 In an attempt to keep the plane in the air as long as possible, they threw overboard all not strictly necessary equipment including their guns, ammunition, their flack suits and the bomb site. With the flaps down to 30 degrees, they made their way to what they hoped would be Sweden. Because the Hydraulic system was shot out, the flaps and landing gear all came down. This was a Swedish news photo. This is the account as recorded in the book "Making For Sweden" page 91. Aircraft '973' was last seen at 1243 hours at 5450N-1400E. The crew was observed throwing out all loose equipment ion order to lighten the aircraft." Sometime around 2:30 or 3:00 PM, they were able to get the plane landed. I believe they landed in a field and hit a fence. The plane was immediately surrounded by men with machine guns. This led them to believe that they were in Norway which was occupied by the Germans. About that time a tall blond man stepped forward and said "Welcome to Sweden." John Forsyth shouted out, "Could you point those guns the other way." The Swede replied, "Don't worry. They're not loaded." They had actually landed at Bulltofta A/F near Malmo, Sweden. An ambulance took Sawyer and Rhodes immediately to the hospital. The base commander welcomed Forsyth and the rest of his crew. There had been 5 planes land there that day. Forsyth was the oldest so the base commander made him in charge. He asked Forsyth what he could do for them. Forsyth asked if they could have some food. He said, "I know these men are hungry". They marched to the mess hall and were served the only thing they had left; soup and biscuits. The commander asked if they wanted any milk. They were not allowed to drink the milk in England so Forsyth asked if it was pasteurized. The commander looked at Forsyth as if he was out of his mind and said, "Of course it's pasteurized." Forsyth reports "So they brought out pitcher after pitcher of milk. You never saw guys go through milk so fast in all you're life. They hadn't had any for months." Meanwhile, Prueher was back in England. It had been quite a night of celebration for him. He didn't wake up until almost 2:00 PM. Each of the huts had a filed phone. The one in Prueher's hut was right next to his bed. He immediately called over to the headquarters to find out what time the planes were due back in. He was told that they should start coming in in about 20 minutes. He wanted to get down to the end of the runway to "see the boys come in". Prueher was standing at the end of the runway when 21 of the 22 planes that went out that day came back in. The crew that he had been with for so many missions did not return. "Oh, not fun," he told me with tears in his eyes. "Ever see a sick cookie, that was me. I was sitting at the end of the runway with some nurses, Drs. and others who were interested. When the 22nd didn't come in, I went back to the flight line. I was practully crying." Prueher did all he could to find out what happened the rest of his crew. There were eight men from two crews who lived in the hut with Prueher, Forsyth and Burroughs. One of guys, Mestimaker said "I saw them take off towards Sweden." But no one was sure or knew if they had made it. Earlier I mentioned the Catholic Chaplin, Father Gerald Beck and his visit with Charles Kellis during his stay in the hospital. Prueher has his thoughts about Father Beck. He said he was a real character. They referred to him as "Happy" Beck. He recalls that Beck had a gambling problem. In spite of that, he was the best Chaplin anyone ever heard of. He was always doing or saying something to help keep the moral of the men up. One early evening Beck came over the intercom system with this announcement, "This is your Chaplin speaking. I repeat, this is your Chaplin. There will be absolutely no gambling in the officers club tonight. I repeat, NO gambling. Except in the billiard room and the game starts right now." He had the guys going all the time. He gambled and lost it all. If he won 50-60 lbs. he would fade off and go to the enlisted men's club and loose it all. Had a jeep that was for his personal use but he let everyone drive it. 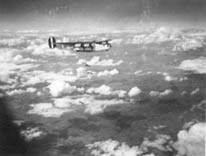 Father Beck came looking for Prueher the next day after the crew had been shot down. He swore that he was 99.9% sure that they were safely in Sweden. He said it was a tough one but they make it. Prueher said "that was all I had to go on." With that information and the hope that his crew was safe, Prueher went to the Lt. Col. the second in command, trying to find out some details and more information. He wanted to see the Col. but he recalls, "No one noticed me. What the Hell do they care about one lousy plane? They loose one every other day. Their job is to put the bombs on the target they tell 'em to. They wanted me out of there." When a crew is lost, they get those men's belongings out of there within hours. They don't want someone sleeping in there with four empty beds. That kind of atmosphere is not good for moral. So when Prueher got back to the hut around 3:00 PM, there were 3 or 4 guys pulling the lockers apart of Forsyth and Burroughs. "Wait just a minute," Prueher said. "I don't want you taking all this stuff." He was concerned what might be there that maybe shouldn't be sent home. They promised it would be looked over before it was sent home. In fact they said it wouldn't be send home until the war was over. 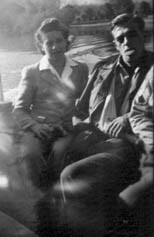 Burroughs was a "super religious Southern Baptist" from Oklahoma City. When they opened his locker, they found something similar to a brief case. When they opened it up they found stacks of money. He didn't spend anything and he didn't believe in the bank. Had stacks of money. Prueher was concerned about what might happen to that much money. It belonged to Burroughs and we wanted to make sure he got it, all of it. "I will take that. I will see to it that he gets that back," said Prueher. He was thinking, "I will give it to him when he comes home next week," not realizing that he wouldn't be coming home next week. There was a Captain there who was in charge. He talked to Prueher and assured him that it would be closed and sealed and it will go back to Mr. Burroughs, his mother and father or whoever the next of kin is. He guaranteed Prueher that nothing would happen to it. As Prueher got to thinking about it, he realized that he didn't want to be responsible for that much money and agreed to let them take it. They took all of the men's belongings and put it all away. When the men got back, they went to the 389th and were able to get their belongings. 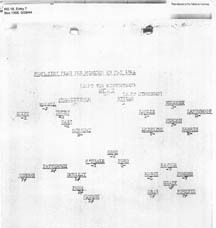 Three days after the crew had been shot down, orders came through for Prueher and Mestimaker and they were flown to Ireland. Prueher was there for three months as a navigation instructor. During that time, the two men received a 10 day pass and went to London. While they were there, the invasion started, June 6th. Prueher feels he is perhaps one of the last 10 people in the world that knew that invading was on. They were staying in a big hall of a hotel. They had sheets hung up between the beds. It must have been around noon the day of the invasion when someone came in yelling, "Get up you yanks, don't you know there is an invasion on?" Prueher pulled the sheets apart to talk to Mestinmaker, "Invasion!" Mestinmaker was a "real eager beaver" and went crazy. He wanted to be a part of the invasion. He wanted to get active and fly some more missions. Prueher said he was all done. 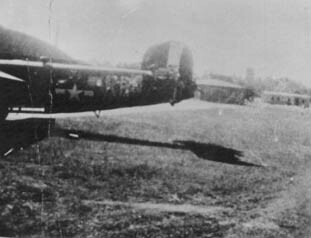 The 389th would do 2 to 3 missions a day. All they did was fly over drop their bombs and come back for another load. Prueher recalls that it was about the time he was sent to Ireland that the Germans started using B1 and B2 bombs. They would put a bomb on a ski slide, light the fuse and try to hit London. He also tells about guys who would go through what we did and survive and then go to London and get killed in some stupid way. He said that they had bombed Berlin on 7 occasions during his time of duty at Hethel. He was personally only on one of those missions. However, there was a guy that was sent to Ireland just a couple of days after he was. This man had been unlucky enough to be on all 7 missions but had managed to survive. Then on night he took a jeep into London, got drunk and rolled the jeep on the way back and was killed. It was either the day of the invasion or the day after that he flew to Ireland. It was there that he was introduced to a G-box. As a permanent party instructor, he taught 20-30 crews how to use a G-box during there 10-12 day class. He had to learn how to use it first himself. He said you look in it and line up two lines like a test pattern. Using a special map, he could tell you were you were in 40 seconds and be within 100 feet. You knew your exact coordinates in a very short time. Then you could tell the pilot how to fly to an exact spot. Of course it all jammed up when you got to the enemy coast. After about two or three months after we started using G, a ME was shot down and there was a fully operational G-box in it. They had shot down one of our planes that had a G-box in it and in less than 6 months after we invented it, they had it too. That was the same thing we did to them. They had highly technical inventors too. Prueher said it was kind of boring at times. All of this was as the final things were going on with the war. He was sent back to the States around September 1st. "I never did see the boys," said Prueher. Prueher says, "I should have written to Norma but I didn't know what to say. What could I say if she asked 'why weren't you with them Bernie?' How do I answer that? There wasn't anything I could do but I'm embarrassed when I talk about it a lot of times." Meanwhile, back in Sweden, the crew were given rooms for the night and the next morning they boarded a train and headed north. Rhodes and Sawyer were in the hospital. The rest of the crew went up to Loka Brunn which is an old Swedish spa in the mountains. They were given temporary passports. They were not allowed to go into town until they got civilian clothes. They picked up some "crummy looking" civilian clothing. None of them had a full military uniform. There were certain towns that they could not go into. Because it was so cold while flying, they never wore a complete uniform. They would put on long johns, a heated suit that plugged into electric but most of the time it didn't work. Then an old jean shirt, field jacket which was over sized and fur lined boots. They didn't have much to do during this time. "It wasn't bad other than it was boring." They played soccer and rode bikes. It seems that there was a charcoal taxi that they would take into a bigger town about 20 or 25 miles away from Loka Brunn. Sometimes when they got to a big hill they had to get out and push. There is a note on the back that says that is a cookie in his mouth. I don't know where the picture was taken but you can see his right arm is in a sling. The 20 mm shell had taken a piece of bone out of his arm. Forsyth said if it wasn't for the skills of the Swedish doctors, he would have lost the use of his arm. He was in the hospital there for 3 months before being sent England for more treatments. He had sent letters to Rhodes while in the hospital in Sweden. The last time Rhodes saw him was in LaGuardia airport July 1945. At that time he was in "fair health" with semi-use of his wrist. I have the MIA reports that the crew later filled out for the Government. You can see them here. All of these brave men received the well deserved Distinguished Flying Cross. Michael Carrigan had taken the place of one of the guys who had quit early on. Thank you Mike wherever you are. According to a Swedish researcher, it had flown 10 missions not counting this one. 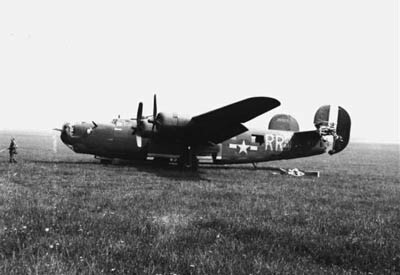 14th Combat Mission -- Landed in Sweden due to extensive damage to engines and tail structure -- 2 WIA, and aircraft interned. However, I have found this list of the missions and it shows this one as number 14. To go to first 28 missions. Home To go to stay in Sweden.